Shirazi, N., Seyyed Esfahani, M., Soleimani, H. (2015). Modeling and solving a three-stage fixed charge transportation problem considering stochastic demand and price. Journal of Industrial Engineering and Management Studies, 2(1), 27-40. N. Shirazi; M. Seyyed Esfahani; H. Soleimani. "Modeling and solving a three-stage fixed charge transportation problem considering stochastic demand and price". 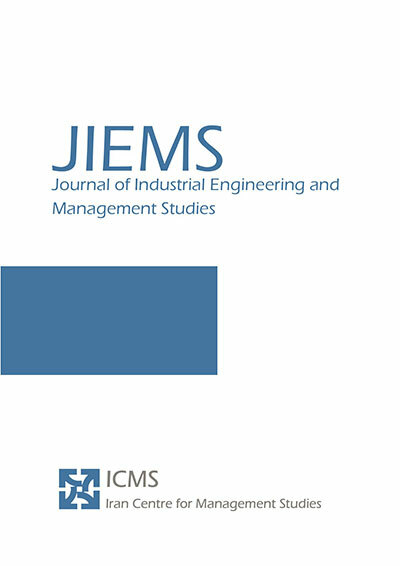 Journal of Industrial Engineering and Management Studies, 2, 1, 2015, 27-40. Shirazi, N., Seyyed Esfahani, M., Soleimani, H. (2015). 'Modeling and solving a three-stage fixed charge transportation problem considering stochastic demand and price', Journal of Industrial Engineering and Management Studies, 2(1), pp. 27-40. Shirazi, N., Seyyed Esfahani, M., Soleimani, H. Modeling and solving a three-stage fixed charge transportation problem considering stochastic demand and price. Journal of Industrial Engineering and Management Studies, 2015; 2(1): 27-40. 3Faculty of Industrial and Mechanical Engineering, Qazvin Branch, Islamic Azad University (IAU), Qazvin, Iran. This paper considers a three-stage fixed charge transportation problem regarding stochastic demand and price. The objective of the problem is to maximize the profit for supplying demands. Three kinds of costs are presented here: variable costs that are related to amount of transportation cost between a source and a destination. Fixed charge exists whenever there is a transfer from a source to a destination, and finally, shortage cost that incurs when the manufacturer does not have enough products for supplying customer’s demand. The model is formulated as a mixed integer programming problem and is solved using a multicriteria scenario based solution approach to find the optimal solution. Mean, standard deviation, and coefficient of variation are compared as the acceptable criteria to decide about the best solution. Adlakha V., Kowalski, K. 1999. “On the fixed-charge transportation problem”. Omega, 27(3), 381-388. Adlakha V., Kowalski, K. 2010. “A heuristic algorithm for the fixed charge problem”. Opsearch, 47(2), 166-175. Adlakha V., Kowalski K., Lev B. 2010. “A branching method for the fixed charge transportation problem”. Omega, 38(5), 393-397. Adlakha V., Kowalski K., Vemuganti R. R., Lev B. 2007. “More-for-less algorithm for fixed-charge transportation problems”. Omega, 35(1), 116-127. Adlakha V., Kowalski K., Wang S., Lev B., Shen W. 2014. “On approximation of the fixed charge transportation problem”. Omega, 43(0), 64-70. Antony Arokia Durai Raj K., Chandrasekharan R. 2012. “A genetic algorithm for solving the fixedcharge transportation model: Two-stage problem”. Computers & Operations Research, 39(9), 2016-2032. Balinski, Michel L. 1961. “Fixed‐cost transportation problems”. Naval Research Logistics Quarterly, 8(1), 41-54. Diaby, Moustapha. 1991. “Successive linear approximation procedure for generalized fixed-charge transportation problems”. Journal of the Operational Research Society, 991-1001. El-Sherbiny, Mahmoud M., Alhamali, Rashid M. 2013. “A hybrid particle swarm algorithm with artificial immune learning for solving the fixed charge transportation problem”. Computers & Industrial Engineering, 64(2), 610-620. El-Sherbiny, M.M.. 2012. “Alternate mutation based artificial immune algorithm for step fixed charge transportation problem”. Egyptian Informatics Journal, 13(2), 123-134. Eskigun E., Uzsoy R., Preckel P.V., Beaujon G., Krishnan S., Tew J. D. 2005. “Outbound supply chain network design with mode selection, lead times and capacitated vehicle distribution centers”. European Journal of Operational Research, 165(1), 182-206. Gen, M., Kumar A., Ryul Kim J. 2005. “Recent network design techniques using evolutionary algorithms”. International Journal of Production Economics, 98(2), 251-261. Hajiaghaei-Keshteli M., Molla-Alizadeh-Zavardehi, S., Tavakkoli-Moghaddam, R. 2010. “Addressing a nonlinear fixed-charge transportation problem using a spanning tree-based genetic algorithm”. Computers & Industrial Engineering, 59(2), 259-271. Hitchcock, F.L. 1941. “The distribution of a product from several sources to numerous localities”. J.Math. Phys, 20(2), 224-230. Jawahar, N, & Balaji, AN. 2009. “A genetic algorithm for the two-stage supply chain distribution problem associated with a fixed charge”. European Journal of Operational Research, 194(2), 496-537. Jawahar, N., & Balaji, N. 2012. “A genetic algorithm based heuristic to the multi-period fixed charge distribution problem”. Applied Soft Computing, 12(2), 682-699. Kaut, M., Wallace, S.W. 2003. “Evaluation of scenario-generation methods for stochastic programming”. Kim J.G., Jun H.B., Kim, C.M. 2011. “A two-phase heuristic algorithm for the fixed-charge capacitated network design problem with turn penalties”. KSCE Journal of Civil Engineering, 15(6), 1125-1132. Kundu P., Kar S., Maiti M. 2014. “Fixed charge transportation problem with type-2 fuzzy variables”. Information Sciences, 255(0), 170-186. Lev B., Kowalski K. 2011. “Modeling fixed-charge problems with polynomials”. Omega, 39(6), 725-728. Listeş O. 2007. “A generic stochastic model for supply-and-return network design”. Computers & Operations Research, 34(2), 417-442. Lotfi, M. M., & Tavakkoli-Moghaddam, R. 2013. “A genetic algorithm using priority-based encoding with new operators for fixed charge transportation problems”. Applied Soft Computing, 13(5), 2711-2726. Molla-Alizadeh-Zavardehi, S., Sadi Nezhad, S., Tavakkoli-Moghaddam, R., & Yazdani, M. 2013. “Solving a fuzzy fixed charge solid transportation problem by metaheuristics”. Mathematical and Computer Modelling, 57(5–6), 1543-1558. Ogryczak, W. 2000. “Multiple criteria linear programming model for portfolio selection”. Annals of Operations Research, 97(1-4), 143-162. Panicker, V.V., Sridharan R., Ebenezer B. 2012. “Three-stage supply chain allocation with fixed cost”. Journal of Manufacturing Technology Management, 23(7), 853-868. Pintea C.M., Sitar C., Hajdu-Macelaru M., Petrica P. 2012. “A Hybrid Classical Approach to a Fixed-Charged Transportation Problem. Hybrid Artificial Intelligent Systems, 7208, 557-566. Raj, K Antony Arokia Durai, & Rajendran, Chandrasekharan. 2011. “A Hybrid Genetic Algorithm for Solving Single-Stage Fixed-Charge Transportation Problems”. Technology Operation Management, 2(1), 1-15. Safi, M. R., & Razmjoo, A. 2013. “Solving fixed charge transportation problem with interval parameters”. Applied Mathematical Modelling, 37(18–19), 8341-8347. Schaffer, Joanne R, & O'Leary, Daniel E. 1989. “Use of penalties in a branch and bound procedure for the fixed charge transportation problem”. European journal of operational research, 43(3), 305-312. Soleimani H., Seyyed-Esfahani M., Shirazi M. 2013. “A new multi-criteria scenario-based solution approach for stochastic forward/reverse supply chain network design”. Annals of Operations Research, 1-23. Vinay, VP, Sridharan, R. 2012. “Development and analysis of heuristic algorithms for a two–stage supply chain allocation problem with a fixed transportation cost”. International Journal of Services and Operations Management, 12(2), 244-268. Xie F., Jia R. 2010. “A note on “Nonlinear fixed charge transportation problem by spanning treebased genetic algorithm”, Computers & Industrial Engineering, 59(4), 1013-1014. Xie F., Jia R. 2012. “Nonlinear fixed charge transportation problem by minimum cost flow-based genetic algorithm”. Computers & Industrial Engineering, 63(4), 763-778. Yang L., Liu L. 2007. “Fuzzy fixed charge solid transportation problem and algorithm”. Applied Soft Computing, 7(3), 879-889.